SASA is one of my favorite restaurants on Shaker Square. Scott and Brenda Kim’s restaurant is the first izakaya — the Japanese version of a tapas bar — in Cleveland. The small, medium and special plates offer something for everyone. My friends and I love to meet here on Monday, when they feature their $5 happy hour, which is normally only at the bar from 5-6:30 pm, all night at the bar as well as the dining room. The happy hour menu is fairly extensive, featuring all small plates, half pitchers of draft beer and select sakes, wines, martinis and cocktails for just $5. I have tried a lot of things on the menu over the years. One thing never changes — I always order the plum saketini. I have gotten many of my friends hooked on this delicious little martini. I have no idea what exactly is in it, but it must include plum wine and some kind of sparkling sake. It is fruity, light and delicious. It is $5 during happy hour and $10 outside happy hour. One other must are the SASA fries. The fries here are something really special. They come with two choices of house dipping sauce (I prefer the creamy orange one, but both are delicious), and the fries are covered in shichimi pepper, a spice mix, and sesame-roasted, sun-dried seaweed flakes. I have enjoyed many of the sushi rolls here, but my favorite by far is the SASA Fire Roll. At $16 it is pricy, but worth every penny. It lives up to its name , arriving in a flaming foil package that has been doused in a liquor (sake?). The brief brush with heat gives the teriyaki sauce a smoky quality that seasons the lobster, crab, Chinese broccoli and masago (bright orange fish roe) filling. I simply can’t get enough of the delicious char flavor. It’s such a unique and delicious roll! 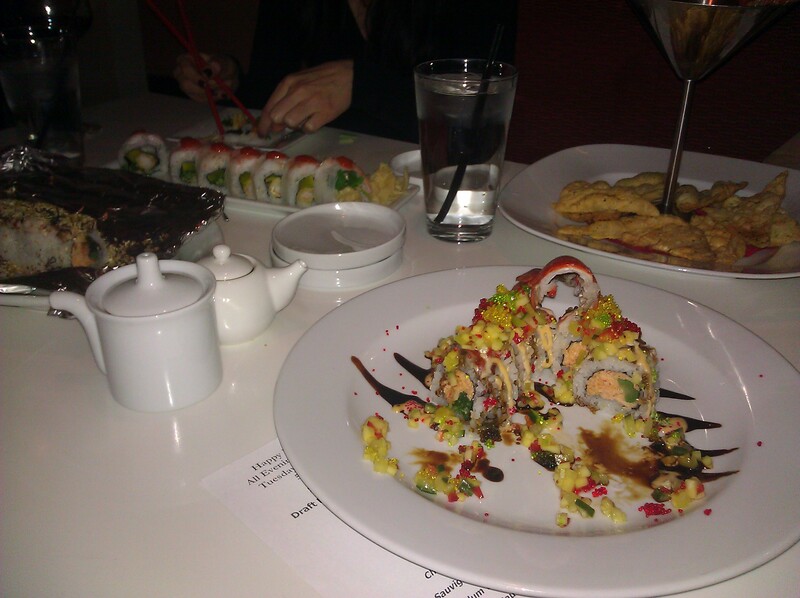 I must mention the cute white bottles and dipping plates for soy sauce that they use with the sushi. The dipping plate is curved to allow the soy sauce to collect in one half, leaving the other half somewhat elevated so you can rest your sushi there if needed. Very elegant! You really can’t go wrong with anything on the menu, from the dumplings, sliders, harumaki, tempura, and udon soup to the ahi tuna steak, five mushroom chicken or grilled or seafood samplers. The sushi is always fresh, and I have never, ever noticed a fishy smell indicating it is anything but super fresh. The green tea ice cream is always a special treat if I have room for it. Paired with a chocolate brownie and strawberry puree it is a decadent little treat. Once you have eaten here you will want to come back again and again. Welcome to the club. Oh yes, there is actually a club. Get a SASA loyalty card at the restaurant, amass points for eating there and earn delicious rewards.